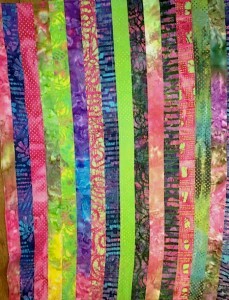 Home » Gallery » Jelly Roll-tastic! 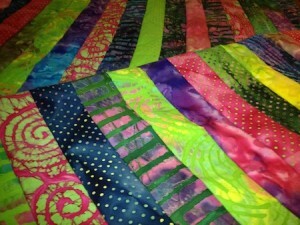 I love jelly rolls because they are so straightforward to work with. Ideal for the beginner quilter, who is taking the first steps into the fabric heaven of quilts to snuggle under and ideal for more seasoned quilters who want to create simply and quickly. 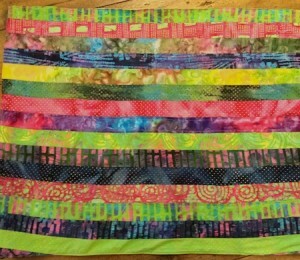 This latest jelly roll I’ve used is fully of striking batiks and bali fabrics in wonderful hues of raspberry, aqua, bottle and spring green, navy and softest pink. Very sumptuous, rich, vibrant and way too “feel good” and chirpy for the current sludgy snow and rain we’re currently experiencing in Hawes today. This type of quilt is so simple to make. 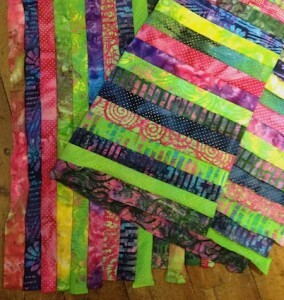 Take your strips and sew the together. You will see I’ve used 1/4″ seams and each width of fabric lies side by side. Once stitched it’s time to press and cut off the uneven selvedge edges at the narrowest point. NOW I always get carried away. It’s an ‘all-or-nothing’ thing…. those who know me well will attest, I’m sure. So I made two! Next to layer and quilt the fleece and jelly roll quilt-top together. 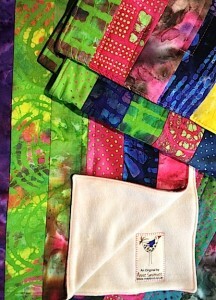 Once pinned securely each quilt was quilted and edged. Looking lovely. Each quilt measures 31″ x 42″ approximately. And then the final touches and attaching the ‘Madbird’ trademark labels. Ah! A slow day turned into a colourful, lovely and creative day. So glad I had a jelly roll to hand and some very fine gentle ivory fleece hiding within my fabric stash. I do keep finding some real treasures in my *small* stash. One quilt is for a friend’s newborn ‘Harriet Grace’ and the other for sale through Chapel Gallery, Hawes. 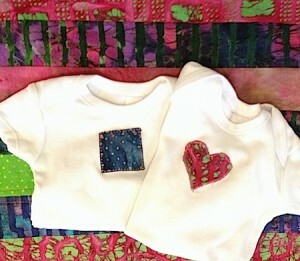 PS : Harriet Grace has another couple of gifts to wear while using the quilt. I do hope she likes them.